I. What is a Limerick? The most popular limericks are extremely rude and often racist or sexist, so we won’t repeat them here. You can look them up on your own if you like. However, no explanation of the limerick would be adequate without at least a little rudeness, so be forewarned – this article contains some explicit language! In a limerick, the first and last word of each line have a little bit of wiggle room (an extra syllable added or dropped is not a big deal), but the middle syllables must follow a strict anapestic meter. Anapestic triameter is a meter with three stressed syllables, while diameter has two. 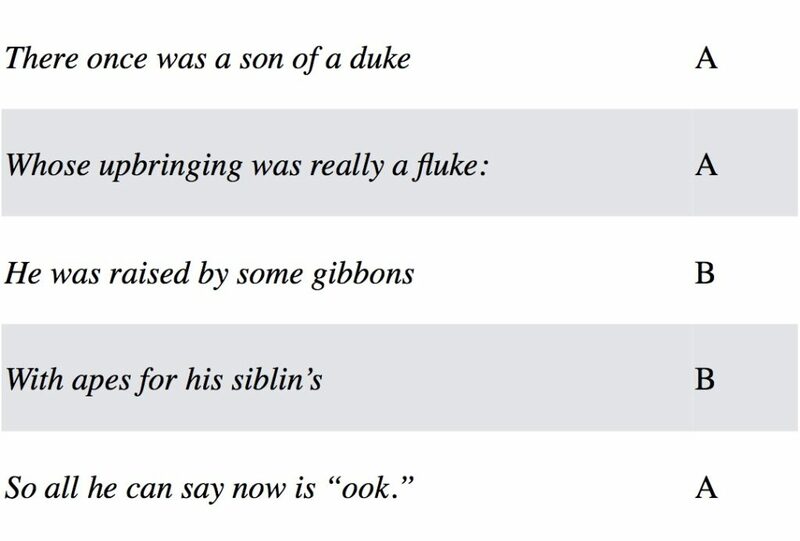 In the examples that follow, try counting the stresses in each line to understand the meter of a limerick. This is a wonderful limerick about limericks, and it both explains and exemplifies the form. Notice that lines 1, 2, and 5 have three stresses each; lines 3 and 4 have only two. This defines the rhythm of a limerick. Like most limericks, this one works best when you read it out loud, especially if you put some emphasis into the ape sound at the end. Limericks are almost always used for comic effect, usually with rude overtones. They are considered a form of “folk poetry,” and professional poets seldom compose in this form except when they are being funny. No one is completely sure where the name “limerick” comes from, but it is probably a reference to the city or county of Limerick in western Ireland. It’s possible that the poems were popular there at some point in the past. However, it might also be that the Englishmen who told dirty limericks simply associated this form of bawdy humor with their Irish neighbors, and that the poems could have been named for the Irish town whether or not they actually came from there. To obey your commands in their whole. Although the limerick is not a very “literary” form, it does have some history that predates all the dirty jokes. The oldest limerick is probably a prayer by St. Thomas Aquinas, which is presented above in a rough translation from the Latin. This tongue-in-cheek limerick, by the author H.G. Wells, refers to the village of Bonga in southwestern Ethiopia – a place where less than 10% of the population is illiterate. The number was probably even smaller in Wells’s day. Although the poem appears to be celebrating, or at least honoring, the illiterate lifestyle of Bonga’s residents, it may also be poking mean-spirited fun at them. Like many limericks, this one is arguably offensive and racist. This limerick, poking fun at the classic fast-food burger, appeared recently on the radio show Wait, Wait, Don’t Tell Me!